7" Cool-Lightweight Lumbar Sacral Support :: Braces and Supports :: FLA Orthopedics Inc.
Quality 7" high elastic with four flexible plastic stays in the back to provide strength to the lumbar region. 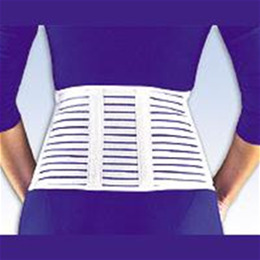 Four inch wide tapered breathable elastic bands overlap and give a contouring shape to most body types. Unique ventilated filament stitch, soft plush finish with an easy hook and loop closure. Ideal for lightweight lumbar support. Latex free.